Summer in America and the United Kingdom is the time of the year that one would be trying to assess the young they have produced as they begin to go into their first moult. Breeders will also be assessing the parents of the young based on what they produced. The youngsters should be studied every two weeks starting from the day they are weaned using the most current Gloster Standard of Perfection. Be sure you are using a Standard that accurately depicts the type of Gloster being selected at the major show by qualified judges. Judge each youngster and its� siblings from the same nest. Do this every two weeks until they are ready for the shows. One way to rate them is with stars. The best being rated with four-stars to the lesser which should get one-star or none, as the case may be. See how they improve or deteriorate in the weeks to come. Do your first culling as soon as the young are cracking seed on their own. This can only work if you really know what to look for in the young. If you don�t have any quality photos of super-quality Glosters to use as models and you perhaps like the type of Glosters I raise, may I suggest using the color photos I took of my Glosters which appear on my website: www.houseofcrests.com . If you have other photos of the type of Gloster you are striving for, use them. How you dispose of your culls at this stage is your business. Just as long as you get them out of your birdroom. You don�t need to spend any more money continuing to raise, feed and allow inferior birds to take up valuable cage space. Especially if you are housing more than one youngster per cage. If possible each youngster should be enjoying a cage by themselves. This is more important for your corona young than it is for your consort young. Why is it the Gloster Corona with nicest crest seems to always be the easiest and tastiest target for the other occupants of the same cage? This only has to happen once before you realize that you must immediately isolate those contenders. Every two weeks you should complete an evaluation of all your stock, young and old. Upon completion you should always cull and dispose of the inferior youngsters and any of the test adults that produced a majority of any of the rubbish you might have. Train your eye to look for the best in your room. No need to merely be a birdkeeper. Unless of course, your desire is to raise pet birds for yourself and your friends. If you want to raise superior Glosters you must be ruthless in your culling process and environmentally conscious of how you dispose of these culls. In other words, if they�re culls that you know can�t improve another Gloster fanciers stud then you should not let them get in anybody else�s Gloster breeding environment! Especially the novice Gloster breeder environment, for they have enough to deal with in getting started in the fancy without a bunch of someone else�s garbage. Train your Glosters to enjoy the Gloster show cage and use the standard show cage drinker early on. Work all the birds as if each would be a possible contender on the showbench. Give your birds every possible advantage. If you find the stock you�re working with is not the foundation needed to get you to the top in short order, now is the time to seriously think about regrouping. Start by making a mental note of where you obtained your initial stock. Did it come from a solid, consistent winning line that has stood the test of time? If not, consider a new source. Remember to have some guidelines when seeking to purchase your stock. Are you sure that the stock you are purchasing was indeed produced in that champion breeders� birdroom or not gathered for you up the road from some other breeders room? Study the consistency between what the champion breeder is winning with along with what he or she has in his or her own birdroom and what they are attempting to sell to you. Ask to see the siblings and parents of what is offered to you. If you do not see any consistency between what is offered to you and what the breeder has kept for his or her own use, what are the odds that you will produce the quality you are looking for from what they are selling you? Do you see any success in the immediate future with the stock you are presently using or planning to purchase? If not, how long do you think it will take for you to get where you want to be? Maybe you want to reach your goal quicker. If so, now is the time to do some extensive research on what is available in order to reserve what you will need for the upcoming breeding season. Don�t hesitate in reserving your stock now. Breeders with a solid proven line take reservations for their finest surplus early. May I offer the following suggestions on creating a �strong foundation,� as I insert in this article some excerpts from the book I attribute as the major tool that put me on the path to creating my champion line many years ago. A line I might add that continues to improve to this day. May I suggest that you purchase this book if you want to succeed, regardless of what you want to breed. The author is David D. Kowalski. The name of the book is The Secrets of the Great Animal Breeders. Here are some profound excerpts from his phenomenal book. Read the following information for it is exactly what you must do in order to achieve your goals. �Every good carpenter knows that the strong foundation is the only one worth building on. The same rule applies to building a strain of animals. Your foundation specimens will continue to exert a strong influence on your stock for generations, whether good or bad. Since most breeds of animals and birds reproduce fairly rapidly, there is no advantage to begin with large numbers of foundation animals just for the sake of sheer numbers. Any initial lack of numbers will quickly be remedied. You may acquire many poor quality specimens for the price of a few truly good ones, but if you end up discarding half of your poor specimens after a year or two, then you have saved nothing. Furthermore, they would have contributed some of their undesirable genes to the herd before they left, whose presence could plague you for years. If you plan to have real �purebreds� in the shortest amount of time, for the lowest eventual capital outlay, then a few of the highest quality specimens that you can afford are the most desirable acquisitions. In addition, it is sound policy to confine your choice of foundation stock to just one noted strain, provided that all the necessary traits are present in various members of the strain. Some writers advocate starting with stock from at least two sources so that you can demonstrate your genius as a breeder by combining the best features of both strains. This advice is both silly and foolish. Even if you start with stock from only one source, your selection, management, and success in establishing increased genetic purity will often significantly alter that stock and stamp it as your own in just two or three generations. This latter animal cannot help you for the features under consideration; it can only harm the better strain. I didn�t mean to take so much from the Kowalski book but to leave out any part would have ruined the entire content and the point I was trying to make in my part of this article. This excerpt is only a small part of all the information you would get from Mr. Kowalski to help you become successful. The Kowalski book is loaded with information for any breeder of any livestock. Unfortunately, I have been unable to locate any more copies of this book or any address for Mr. Kowalski and as such cannot refer you to a place to purchase it. Some additional advice when setting up appointments with breeders to view the offerings they might have set aside for you. Firstly, regardless of how anxious you are in obtaining your stock, never allow yourself to be scheduled for an appointment after 2:00 p.m. at the breeders to review the stock they might have available. Reschedule for a later date at an earlier time of the day so that you may see them in their best light, no pun intended. 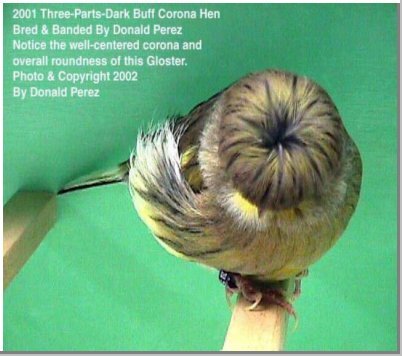 In most countries of the world, Type Canaries, of which the Gloster is one, tend to finish up the molt in the fall of the year. This is naturally when the days are getting quite short as well. That being the case, it is natural for Glosters to tend to get snuggly and want to find a cozy spot-of-choice to roost for the evening. They get a little less active and even get a bit chunkier as they settle in for the late afternoon or evening. Especially those Glosters in the lower cages where it is usually darker and cooler. By lower cages, I mean the ones closest to the floor or at least the bottom two rows of cages. The lower cages in any birdroom have the tendency of being of 10 to 12 degrees colder than the upper rows of cages. This is the main reason why Glosters would appear cobbier in the lower cages of a birdroom rather than the higher cages. I am not trying to say that if a breeder schedules your visit to their birdroom in the afternoon that it is with the intent of they misrepresenting the stock they intend to sell to you. Just a word of caution and buyer-beware. I offer this advice though as I myself have fallen victim to this tactic of accepting canaries which looked better at that time of day in their birdroom on more than one occasion then they did when they were finally landed in my home so had since vowed to alert all others to remember this tidbit. All the best and should you have any questions on diet, environment, standards, showing or managing Glosters, please feel free to visit my website mentioned above. If you still have questions, please do not hesitate to send me an e-mail. AUTHORS NOTE: It is a criminal offense to infringe a copyright, willfully and for purposes of commercial advantage or private financial gain. Fraudulent removal of a copyright notice is also a crime, as is the use of a fraudulent copyright notice and making a false representation on a copyright registration. Penalties include up to five years� imprisonment (Ten years for subsequent offense) and fines. Please, do not reproduce, use in an ad, alter or modify my photos or articles.